Q: How can I avoid back pain? A: Prevention is the best strategy for coping with back pain and can save a great deal of time and agony. Become an educated health care consumer by learning about effective prevention methods. Stretch before and after strenuous activity. Use good posture at all times, and do not slouch. When standing, keep your weight balanced on both feet rather than shifting it back and forth. When sitting for long periods of time, take frequent breaks. Maintain a healthy weight and try to avoid weight gain, especially around the mid-section, which can take a toll on the low back. Don’t try to lift objects that are too heavy for you. When lifting, use the strength in your legs more than the back. Avoid smoking, which accelerates degeneration in the spine. Q: Why do so many people suffer from back pain? A: With age, our bones and muscles lose tone and elasticity. They become less able to properly cushion the vertebrae and more likely to spasm or break. When a spinal disc ruptures or bulges, it places pressure on the surrounding nerves and results in pain signals traveling to the brain. Other factors such as smoking, obesity, poor posture and lack of sleep can also contribute to back pain. Q: How can I incorporate ergonomics into my everyday lifestyle? A: Applying ergonomics can help prevent repetitive motion injuries such as carpal tunnel syndrome, particularly if you are constantly working at a computer. When typing, press the keys gently; do not bang them or hold them down for long periods. Keep your shoulders, arms, hands, and fingers relaxed. Q: What’s the difference between a slipped disc, a bulging disc, a ruptured disc and a herniated disc? A: All four cases occur when discs become weakened over time and part of a disc is sticking out between the bony parts of the vertebra. Q: When should someone consider surgery for back pain? A: After nonsurgical treatments such as ice and heat therapy, bed rest (1-2 days at most), exercise, injections and medications have not proven effective, your physician may consider recommending surgery. A back pain sufferer may also want to explore alternative treatments such as acupuncture. Q: It doesn’t make sense to me to treat my back pain with exercise instead of rest. Please explain! A: Lying in bed causes muscles to weaken, which inhibits recovery. Even though activity may be uncomfortable or hurt a bit, this doesn’t mean that it’s worsening your condition. On the contrary, building strength in the muscles surrounding the vertebrae can help achieve a full return to activity. Also, on the mental side, being bedridden can lead to feelings of frustration and hopelessness, which can slow you down. Regardless, studies have shown again and again that activity leads to a quicker return to work. A: Minimally invasive surgical techniques provide the opportunity to successfully treat back problems with minimal interruption to the patient’s regular, active lifestyle. Results achieved from these methods have been proven to match that of conventional "open surgery." The surgeon makes smaller incisions, sometimes only a half-inch in length. Through these tiny incisions, the surgeon inserts special surgical instruments and probes in order to access the damaged disc in the spine. By using minimally invasive techniques, access and repair to the damaged disc or vertebrae is achieved without harming nearby muscles and tissues. 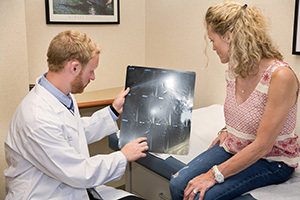 Other benefits of minimally invasive techniques include shorter surgery duration and recovery time, less visible scars and reduced pain and blood loss. Q: How can osteoporosis impact the spine? A: Osteoporosis can have extremely serious consequences on the spine. Because osteoporosis often progresses undetected, the first indication could be as disastrous as a bone fracture. These fractures typically strike an area of the body that carries the most stress, such as the spine, wrists or hips. Spinal fractures can occur without notice, as vertebrae simply compress. Compression fractures can be very painful and may lead to stooped posture, loss of height and risk of serious neurological damage to spinal nerves. A: Scoliosis is a disease characterized by an abnormal curvature to the spine, in which the vertebrae twist like a bent corkscrew. In less severe cases, scoliosis may cause the bones to twist slightly, making the hips or ribs appear uneven. Scoliosis can progress into a serious health problem if bones become so severely twisted that they compress vital organs or if the spinal deformity is so severe that spine health and posture is threatened. If this happens, surgery may be necessary. If left untreated, severe cases of scoliosis can shorten a person's life span. The best way to care for scoliosis is to achieve early detection and take measures to minimize its progression. Q: What is degenerative disc disease? A: A natural byproduct of aging is the loss of resiliency in spinal discs and a greater tendency for them to herniate, especially when placed under a weighty load, like when we lift heavy objects. Additionally, some people have a family history of degenerative disc disease, which increases their own risk of developing it. When a natural disc herniates or becomes badly degenerated, it loses its shock-absorbing ability, which can narrow the space between vertebrae. Q: Who is a candidate for the artificial disc? A: Patients with a diseased disc between L4 and L5 or between L5 and S1 (all in the lower back) that is worn out or become injured and causes back pain are candidates for the artificial disc. Other candidates include those with degenerative disc disease (DDD) whose bones (vertebrae) have moved less than 3mm. Your physician will help you determine whether or not the artificial disc is a good choice for you. Factors that will be considered include your activity level, weight, occupation and allergies (Source: Charite Artificial Disc). Q: What are the benefits of the artificial disc? Q: Are there any drawbacks associated with the artificial disc? A: When treating knee and hip replacement patients, orthopedic surgeons try to postpone the implantation of an artificial joint until a patient is at least 50 years old so that they do not outlive their artificial joint, which typically lasts anywhere from 15 to 20 years. Revision surgery, which may be necessary to replace a worn-out artificial joint, can be complex. 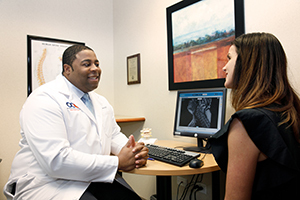 Q: Do you offer laser spine surgery options? A: Patients often ask us if they are candidates for laser spine surgery, with the impression that a procedure involving "laser surgery" uses the most up to date technology available. In reality, however, significant advances have been made that improve on the many limitations inherent in laser spine surgery. 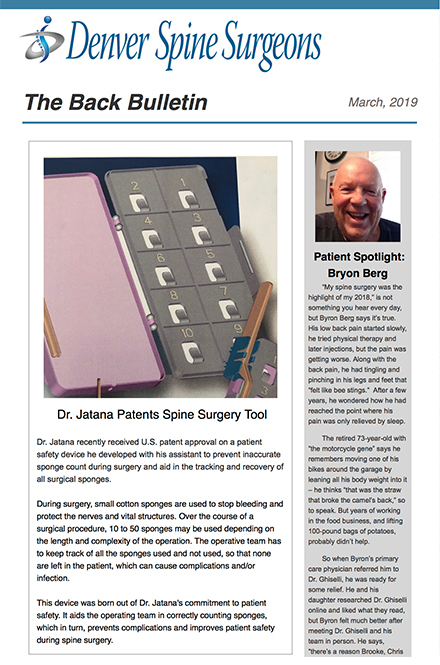 Minimally invasive spinal microsurgery utilizing an advanced, high technology operating microscope and retractors or tubes which limit soft tissue trauma during surgical exposure now represents the highest tech spinal surgery available. Q: Colorado law requires us to disclose the pricing for the fifteen most common health services provided. A. you can find that here.